Those of you that follow along on Instagram know that I am conducting an experiment currently. If I wear Spring colors, will it come any faster? Currently my hypothesis is no, but I haven't given up just yet. I am over this whole Winter shindig. And when I say over it, I mean o-v-e-r-r-r-r-r-r-r-r-r it. I am ready for things to look alive again. I'm talking the works. Flowers, the lake, family walks, sandals, open windows, mowing the yard. I'm looking forward to it all. Isn't it funny how when each season comes, I'm all like, "Oh I'm so ready for _____ and all the excitement it brings!" And then when the season starts to come to an end I'm over it and ready for the next one. Jesus knew what he was doing when he made four seasons. He knew those of us with ants in our pants couldn't deal with the same season for 365 days. Anywho. Back to bringing Spring colors into the mix. I'm bringing you this coral jacket I got for $20 on the clearance rack at Banana Republic on my blate last week for Mix it Monday with Lauren. For my first look I went with a casual feel. For my second look I wanted to dress it up a bit for a date night out with the hubs or church. 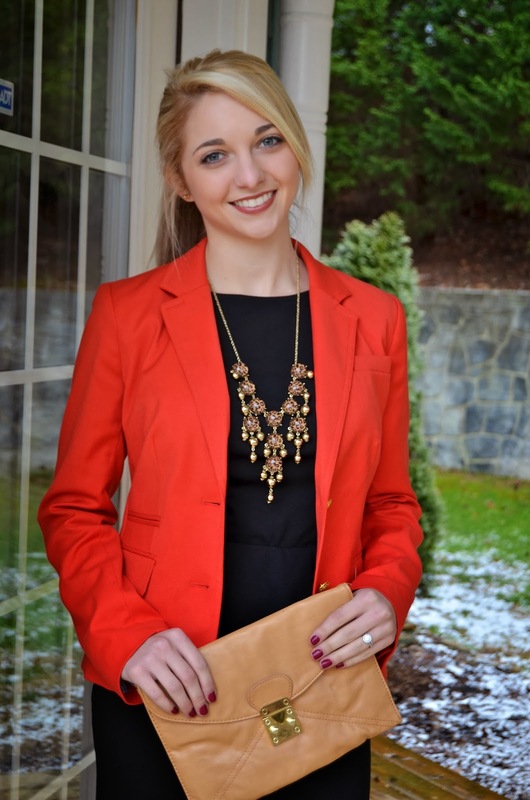 It's so easy to transition any blazer to a dressier look with a few pieces. I chose a peplum dress, a statement necklace and a clutch. 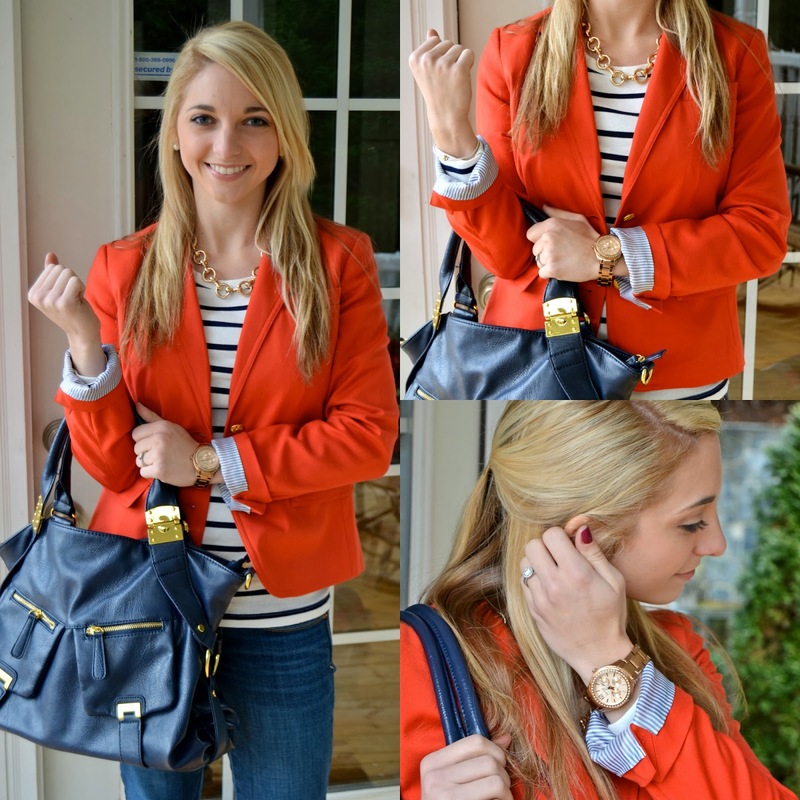 17 comments on "Mix It Monday // Coral Blazer"
I am in love with those shoes! 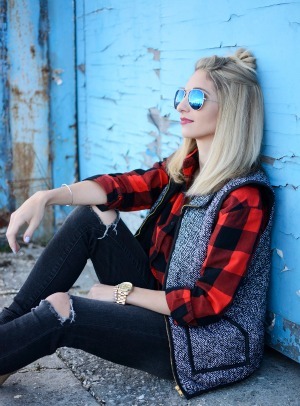 It always amazes me when fashion bloggers can remember where each article of clothing comes from. I spy a tattoo on your foot... and now i'm curious! This is such a great blazer! I'm always looking for a good one, but I have yet to find one that I can really dress down well. I'm so impressed that you got it for $20!! You look adorable, as always! The blazer with the stripped tee is probably my favourite look on you yet (although I love them all- but that just shows how much I loooooove this one). And does your experiment work on changing the seasons for people in different countries? Crossing my fingers it does! That blazer looks great on you! Work it gurl!! You looks stunning, as always! 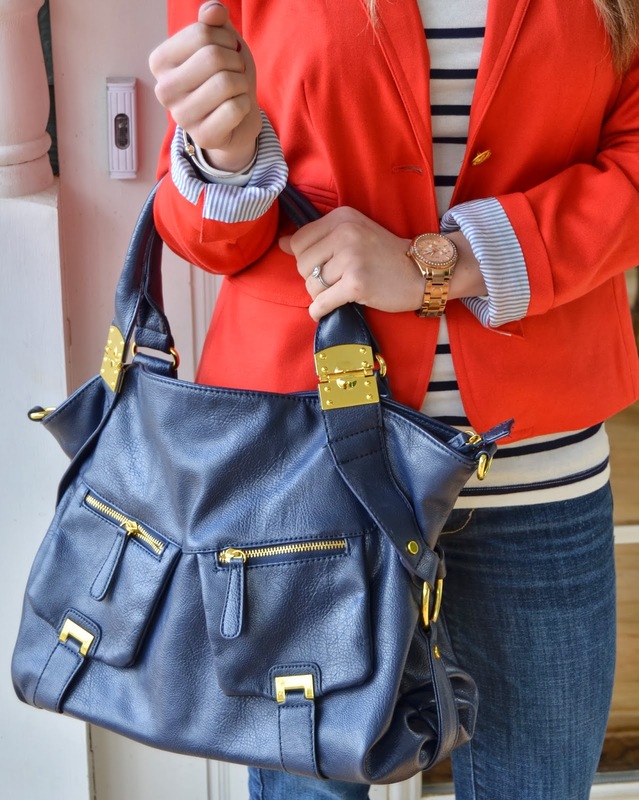 I am loving that navy blue purse :) I think I may have to try this little experiment too, come on spring! P.S. Came by from the Mix It Monday link-up. Both are so cute, you look adorable! Loving the coral blazer and you know what, I'm digging your idea that wearing spring colors will bring it...I'm down to try that too! Looking beautiful girl! I am loving the purse!!! What a steal of a deal on that blazer - really hard to say no when it's that good! Das Outfit sieht richtig schick aus und der Blazer ist sooo schön, absolut mein Geschmack.